Hopefully we were getting somewhere, as at the moment, all we had achieved was wasted time... Amie, OROTHO and Joe were at least working, installing the security door for the tower-side entrance to the tunnel. That would be good to check out when it was finished, but it was likely to take all day. The rest of us waited for THEROS to come back with the collection of maps from the library, whilst AMPHIS continued translating the books piled around him. THEROS eventually came back with a whole stack of rolled up pieces of paper under each arm. Getting to the table AMPHIS was working on, he threw the maps down and began to go through the tags on the side. "AMPHIS? How did you document these...? Is there an order, or just as and when they were made?" "As and when they were made... I didn't see a need or a use to put them in any other way. Why, does it matter?" "Not really, I just wanted to know what order they were in, that's all." "What do you think that means...?" "I don't know, but I don't know why he's going back to check for more. Both him and me know that those are the only maps he has ever drawn up. There aren't any more..."
That was definitely a worrying sign, as it meant that THEROS couldn't place the coordinates on the map. That either meant we didn't have access to that map, or that we had gone back to the possibility that they weren't map coordinates... THEROS eventually returned to the lab, looking incredibly upset about not finding anymore maps. "Are there any more maps that you have filed away in a different place?" "We both know that I haven't. Those are the only maps you've draw up..."
"I was afraid of that then... These coordinates are useless to us at the present moment. I'm ninety five per cent sure that they are indeed coordinates for a map, but we just don't have a map that relates to these coordinates..."
"So we're either back to square one, or we're not looking hard enough... There's a good chance that if a map exists, this person keeps it with them at all times, which means getting hold of it could be difficult... Impossible maybe..."
"True, but there's also the chance that they have hidden it well in the wooden shack somewhere... I suggest that you three go back down and look for any sign of a map. Bring a few more books back if you can, but concentrate on looking for a map, or anything that might help us." "What about that passage way? Is it likely they might have hidden it in there...?" "Why would they do that...? It wouldn't be very safe there... Although..."
UOPETA bent down and flicked the switch, revealing the dark passage beyond. "You two continue looking around in here. I'll check down there. I won't be long..."
UOPETA went into the passage, checking for creases of small pockets in the wood-lined walls, but finding nothing. He then disappeared around the corner. "Where could it be? I bet if there is a map, this person who used to live here still has it. It's exactly the kind of thing I would do..."
I would likely do the same. 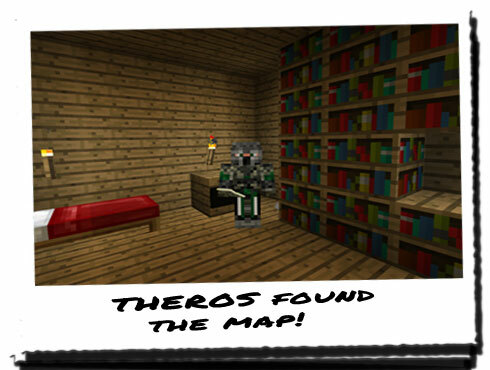 A map is a relatively useful item to have at all times anyway, but when you consider it could contain the locations of many active portals, it becomes an asset we cannot afford to not find... THEROS sat down on the chair and put his head into his hands. Sitting there for some time, not moving or saying anything, I started to look around myself in areas that we had already checked, but I felt could do with another sweep. Turning back around to THEROS, he was crouched under the table for some odd reason... Approaching him, I asked him what he was doing, and he replied by banging his head on the underside of the table! Coming out form beneath the table top rubbing his head, THEROS held a piece of paper in his hand... Looking at the other side, I could see symbols and a grid line. "That didn't half hurt, but it was worth it though... I think I just found it!"